Coffee in Vancouver is part of the culture of the city. As well as the national and international chains, there are many local independents doing their own thing, often with more excitement and devotion than anything Starbucks or Tim Horton's would dare. Around the south Main Street area of the city are a number of good coffee houses, beyond the usual. One that stands out is Gene, just off the corner of Broadway and Main in a uniquely shaped building. Gene is not fancy in any way. It consistently serves good espresso coffees, and always with a small spoon, exactly as a good espresso beverage should be served. They feature some rather nice baked items with the croissants being highly acceptable. The place itself is a bit battered and rustic but it feels right for the neighbourhood; the regulars are legion. Service is not particularly warm and fuzzy, and might, to some, feel slightly unfriendly. That too seems consistent, and shouldn't put a visitor off; the coffee is reason enough to come and linger. Down busy Broadway, just past Cambie as you walk west, is Elysian, my current favourite coffee house. Elysian is a fantastic place with truly great espresso drinks, served with smiles and polite banter. This place offers knowledgeable customer service in a well appointed setting. Pastries, cookies, muffins and treats are all highly recommended and the croissants are among the best in town. Nice selection of quality teas too. A negative at Elysian: you have to ask for a spoon with your espresso drink. Good grief. An amazing positive at Elysian: they provide you the option of having sparkling or still water with your coffee, just like in Buenos Aires, and exactly as good coffee should be served. Elysian also has the best music mix of any coffee joint in the city and for some reason it always fits the mood of the moment. Or maybe it's all that coffee I'm drinking. See some Buenos Aires coffee culture: Cafe y facturas and Esquina Sinclair . We live, at least until the end of the month, in the Lee Building, right on the corner of Broadway and Main, two of the busiest streets in Vancouver. The larger "community" is called Mount Pleasant, though our provincial electoral district is called Vancouver Fairview. Vancouver Fairview is about ten square kilometres in size with a population density of 5000/km. The five or six blocks nearest our building, north and west of the intersection of Broadway and Main, have a lower density; there are fewer high rises and more commercial properties around us, though all of that is changing. Development has arrived and this part of town will alter dramatically over the next few years. For now, in spite of the storm clouds of urban development, there is an almost a prairie-like, small-town-kind-of-feel to the streets in our neighbourhood, with many low rise buildings offering a strange mix of film studio offices, barber shops and auto repair centres. There are still some factories and wholesale warehouses, from a time when that sort of thing actually happened here in abundance. The streets have an amazing Saskatchewan or Manitoba look about them and offer a glimpse of what Vancouver looked like in the past. Except this is the present. Cafes often open during commercial business hours only and cater to the local collection of offices and businesses. There is something less than metropolitan about these wonderful restaurants, a reminder of something that has been lost with the carbon copy look-a-like chains; but then, who now knows about carbon copies? The Argo Cafe is not a carbon copy. And through this wonderful neighbourhood, there are individual homes and old apartment buildings. There are tree lined streets and a community garden, and that strange round thing is mainly always visible, except when its view is blocked by a new condo building. On a beautiful spring weekend Granville Island is home to crowds of people, thousands of sea gulls, and a few buskers. The buskers are, by far, the most entertaining. So one day at the Market we sat down, had a coffee or two, and enjoyed acts by two of them. Stephen Spender is a singer-songwriter with a strong voice and interesting interpretations of songs of other artists and a collection of his own. He seems to let his songs speak for themselves and doesn't offer much in the way of talk between them, though I'd like to hear some of his thoughts about what he has written. Great vocals, nice guitar and songs that resonate through a variety of emotions. Polite and appreciative, Stephen smiles and says thank you when people buy his CD from a box at the front of the "stage." Eden Cheung is a magician with a hilarious rapid-fire commentary on people and events, and he knows how to work a crowd. Idealistic and obviously well-informed, Eden's take on ethnic relations in Metro Vancouver, and his comments about various nationalities, with the emphasis on what makes us different, or the same, are sharp and funny. Midway through his act he ran up to an older man of Chinese-appearance and exclaimed "Dad! You're out of prison!" Then, returning to his "stage" he said, "It's okay, we all look the same to us too." Not to be outdone, the magic at Eden's grand finale is wonderful. How do those oranges appear under the hat? Or the water melon? Both buskers remind us of one of the reasons why we love this city, and because Stephen and Eden, and others too, provide great entertainment we need to be supportive. Would it hurt anyone to applaud or offer thanks with some toonies or a five dollar note? Artists like these buskers enrich the city with laughter, music and wonder. Next time you see a show, don't just walk away: offer your appreciation with applause and more. It's a good thing to do and it's one of the reasons we love this place. We don't have a balcony here at the Lee Building. Nobody else has one either. We had a large porch in Dawson City. We had a great balcony in Buenos Aires. We even had a balcony for several years in Richmond. Not here. What we do have here that the other places don't, is a fire escape, and it provides for some great views of the city towards the west and north. Ideal for sunsets at the beginning of spring in Vancouver. Of course fire escapes are not necessarily meant for viewing the sunset, or anything else. They are fire escapes after all. With a heavy emphasis on escaping if necessary. Especially since the Lee Building's elevator doesn't work right now. Folding chairs and a barbecue on the fire escape might not be such a good idea. staying in a small, studio apartment at one of Vancouver's busiest intersections: Broadway and Main. The neighbourhood is called Mt. Pleasant and while it is busy, it's nothing like Buenos Aires. The Lee Building is an interesting landmark in Vancouver, and it is where the writer, and me, find ourselves for the month of April. Built in 1912 it was among the tallest buildings in the city at the time especially outside the city centre to the north. It was built by and named for Herbert O. Lee. Mr Lee headed a merchant class family in Vancouver, was active in civic affairs and operated a successful grocery business for a number of years. It was an exciting time in Vancouver in the early part of the twentieth century, with fortunes to be made and lost on the booming cycles of the economic activity. Towards the end of the Great Depression in 1937, the Lee family lost their fortune and the property to the Royal Bank of Canada, though they were allowed to continue to live on the top floor until later in the 1940s. It is a seven-story building with hardwood floors and over-height ceilings throughout. We are on the fifth floor looking north towards the downtown and the mountains beyond. Views are impressive and the location is great, if you like this sort of thing. As for us, we get to enjoy the location, the neighbourhood and some impressive sunsets from the fire escape. No balcony here in the Lee Building, and the elevator has been out of service for four days, which adds to the adventure here in our own home town. One morning while walking around our new Vancouver neighbourhood, Mount Pleasant, I came across a structure called The Crosby Building. Indeed it is just a block away from our home in The Lee Building. The Crosby Building is not as impressive a structure as is the Lee, but it has boasting rights as the birthplace of two great musical legends: the Crosby brothers. Though they never appeared together, individually they were towering performers in careers that spanned time and media. Today, the Crosby Building is hoping to raise awareness about this wonderful, and largely unknown footnote in musical history. Bing came along first and became a big hit on radio and in movies of the day. 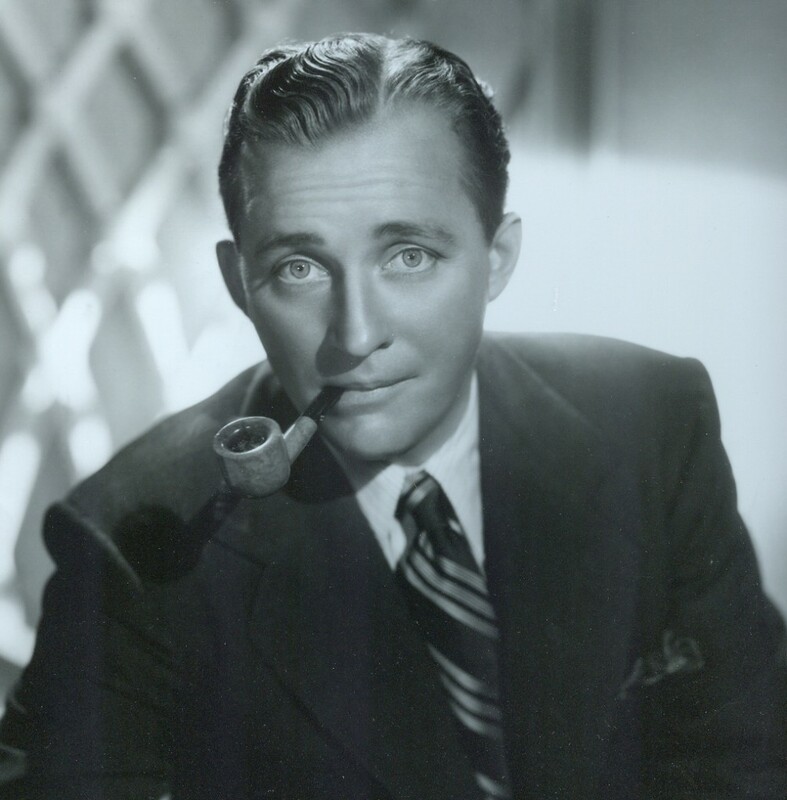 A crooner to be sure and always remembered as a gentleman with a pipe, and often wearing a sweater. 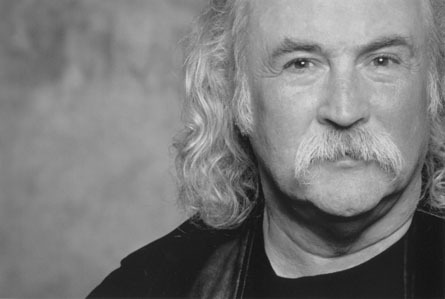 The younger David took a slightly different track and found fame with the folk-rock group Crosby, Stills, Nash and Young. 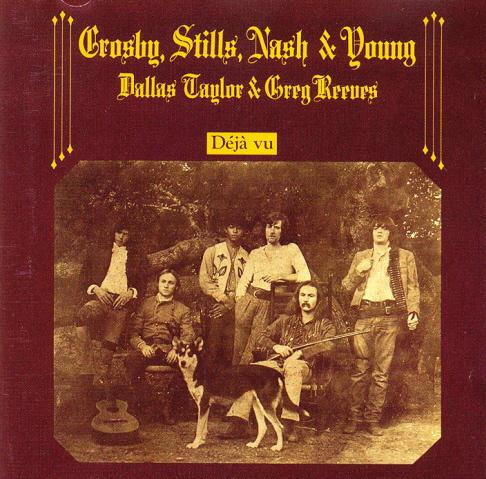 CSNY featured great harmonies and some fine acoustic guitar work, to which David contributed in significant measure. I heard the news of this day in 1968 as a kid growing up in Saskatchewan. I was a young teenager and a huge consumer of television. 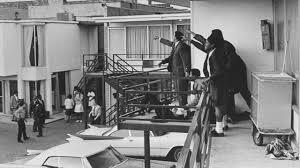 Early that evening, news arrived of the assassination of Martin Luther King, a name and face and voice I knew largely through CBC News coverage of the man and the Movement. 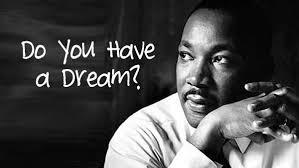 I remember hearing the I have a dream speech, which gave me shivers then, just as it does now. I had already seen the terrible scenes of police beatings of demonstrators, of peaceful marches that were attacked by hooligans and of strange politicians spouting a hatred I couldn't comprehend. I also knew the Americans were at war with a tiny nation in south-east Asia and I couldn't understand that either. Somehow, to me, this man, Martin Luther King, and his message of peace and justice, had something to say about that war too. The reality of America seemed an alien world compared to the America portrayed nightly on its television shows and more importantly, through its commercials. 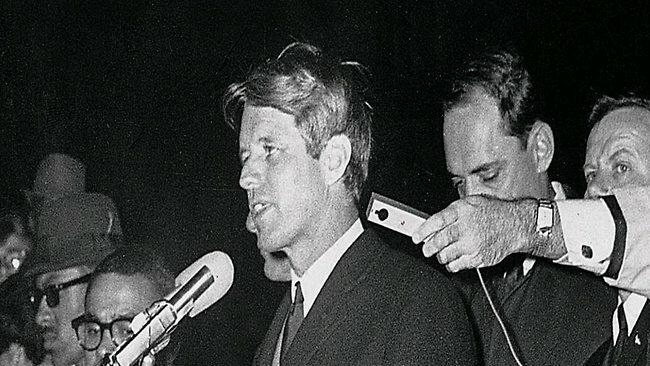 I remember seeing, probably the next day, Bobby Kennedy's speech at Indianapolis as he broke the news of Dr. King's death to a campaign crowd. That speech too sends shivers up and down my spine. Gently, calmly and eloquently Bobby spoke of memory, justice and peace. Over the next weeks, and through the year, I viewed coverage of events in America as they unfolded. I watched, sometimes in shock and sometimes in horror. Today, much older, I continue to view the US as an alien place; a nation seemingly always at war with someone, somewhere, and sometimes nowhere at all. A country still terribly divided by race and class, by money and power, by greed and violence. In April of 1968 the horror was only beginning. It would continue with another assassination, and more state sponsored violence, and with upheaval around the world. The year would become an powerfully formative one in my young life, and inform my political sense for a lifetime. The dream remains. 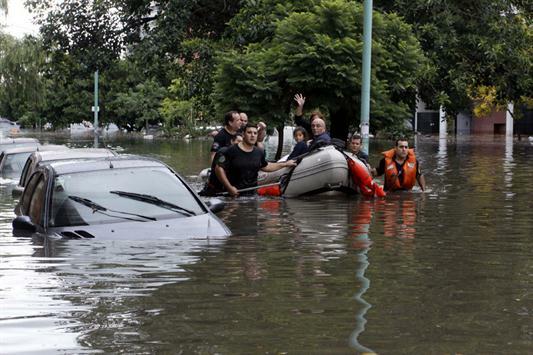 Last night a powerful storm hit Buenos Aires City and Province. 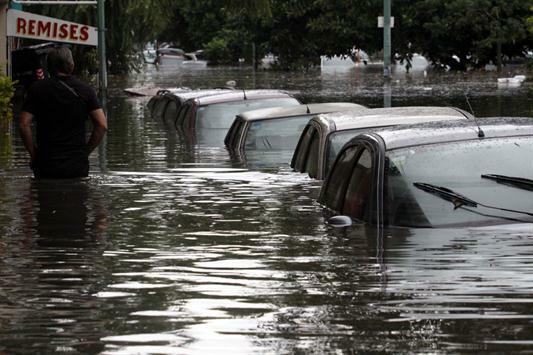 Parts of our old Palermo neighbourhood were flooded to some degree, but other areas of the city were truly devastated. At this writing, twenty-four hours later, eight deaths related to the storm have been confirmed, including one Subte worker. The entire subway system has been running at reduced capacity today, and all of Line B has been closed. 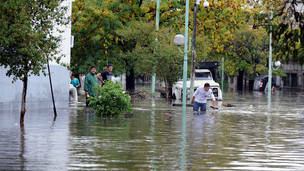 Many areas of the city and province remain flooded and about 500,000 residents are without power (in context: there are about fourteen million people living in metropolitan BA). 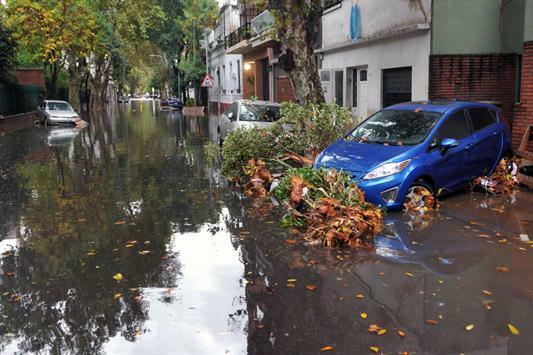 According to the BA City Government more than 155 mm of rain fell in various parts of the city within a two hour period after 6:00 p.m. This exceeded the record of April 8, 1989 when 142 mm fell, the highest for the month of April since records began in 1906. As usual, the politicians have been active too. The Mayor returned from vacation in Brasil and promptly blamed the Federal Government for not having resources in place to deal with the storm. 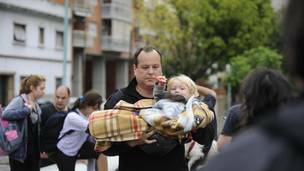 A minister in President Cristina Fernandez de Kirchner's federal cabinet put the blame squarely at the feet of the mayor, accusing him of holidaying abroad while the city suffered. Rumours abound that the Mayor is ready to mount his entry into national politics. Argentina is a highly political arena, and people enjoy their political discussions around coffee and dinner. 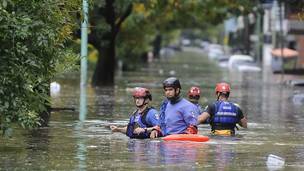 In this tragic situation work now needs to be done to help residents of those areas flooded and to repair the damage throughout the entire city. It will happen, and quite possibly in spite of the politicians. It's unfortunate for the citizens of this great city that politicians have to find their photo ops and sound bites first, even in tragedy. Which reminds me of a BC premier who did the same thing after Vancouver's infamous Stanley Cup riots. Yes, the common touch - in pearls and high heels. Photos of BA from La Nacion and Clarin. Photo of sweeping up from The Sun.